University of Engineering and Management, Jaipur has advertised in THE HINDU newspaper for recruitment of Professor / Associate Professor / Assistant Professor Plus Non-Faculty jobs vacancies. Interested and eligible job aspirants are requested to walk-in on 14th, 15th and 16th November 2018. Check out further more details below. About College: UEM Jaipur was established in the year 2011 by Ordinance 11 of 2011 and Act No 5 of 2012 of Govt of Rajasthan. 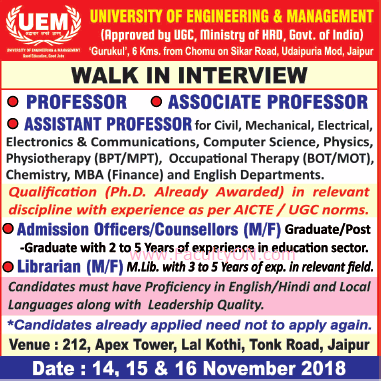 UEM Jaipur has achieved the awards of "Best Private University in North India” and “Best Emerging University in North India"
How to Apply: Interested and eligible candidates are requested to attend the Walk-in interview along with CV, originals & copies of certificates and recent passport size photos to the walk-in address provided below.